First of all I would like to wish everyone a very happy new year. I wish you all health, wealth and happiness for 2016. I started my new job in November in a call centre and loving it. Red velvet ribbon and red flower gem from my old stash. Gorgeous and loving the embossed background and cute butterfly. Lovely white on white creation Sam, with those touches of red. Hello Sam, Happy New Year to you as well, good luck with your new job. 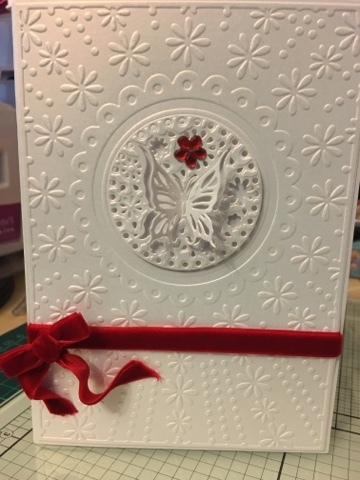 A beautiful card, love the embossing folder.